Sometimes it’s fun to try a different point of view. 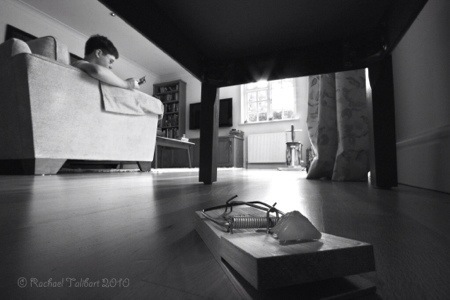 This entry was posted in humour, photography and tagged black and white, interior, low and wide, mousetrap, photograph, photography by Rachael. Bookmark the permalink. How cool! Love this shot. Great! Eagerly awaiting the “after” shot!